"A solid adventure game with a pleasing art style and a wonderful soundtrack. The deluxe version, however, is even better!" Cute and good looking game, that reminds of the spirit of a good King's Quest... If it was doable in 30 minutes. The puzzles are somewhat challenging for the scale of the environement, but you shouldn't spend too much time wondering what to do. I've liked it! The graphics were great. The story was fair, and the puzzles were difficult but logical. I'm new to the community. I honestly expected a much longer adventure, but this was marvelously done. I couldn't have asked for a better hour long adventure game. I was very impressed with the humor! Makes me kind of jealous...maybe you wouldn't mind helping me out once my game is near completion in bulking out the script. Two complaints-- navigating up and down the hill was next to impossible, and while the interface was very innovative, it was a hindrance. I found myself constantly right-clicking, hoping to change my verb faster. Also, the book inventory was interesting, but rather a hindrance as well, having to click the next button several times. Good plot, clever puzzles, nice sprites and backgrounds. It could use some more jokes: the art style is light and clear, some items and puzzles are funny but the dialogs are a bit serious. There is a minor bug (walking in the mountain) but overall, I think it is a really good game. One of the best AGS games I've played. Even though its a little short, its definitly worth checking out. Nice game, a bit short but the graphics are made well. 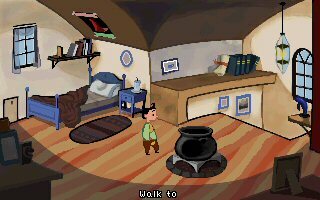 I've played this game a long time ago, maybe 2-3 years ago, one of my first point and click games to play. I love it. Amusing, great storyline, good interface and graphics. Worth downloading and I'm thinking about re-downloading it and playing it again. Apprentice is a fantastic AGs classic. The only gripe I have with this game is the length. It is frustratingly short when you really want to spend hours in Willowbean with Pib. Still, you can hardly complain when everything else about this game is so fine. The graphics in Apprentice are superb, cute cartoony characters and a lush, bright land provide a feast for the eyes. The script is just as superb, with some of the funniest exchanges coming in the introductary scene between Pib and Lord Ironcrow. For such a short game, the creators have packed in tons of great lines and introduce us to five colourful characters who will return in the sequel. The music is predictable but pleasant, unlike many games which opt for the harshest and most annoying electronic sounds. All in all, Apprentice is brilliant and I would have happily paid money for a game of such indisputable quality had it been longer. As it is, it amounts to just under an hour of gameplay but it's a hugely entertaining hour. Oh, I have a few more things I want to say. The music in this game is great! It has consistency and has as much a part in adding character to the game as the artwork. One small complaint I have is with the game's interface. It would have been nice if I could cycle through the available actions with a key or a mouse click. The 1-4 action keys are nice, but being able to cycle through actions is also handy for times when I get stuck. Also, the inventory interface is rather poorly designed - you can't use the 1-4 keys with the inventory objects. Anyway, this is a fantastic game. I don't see why games like 5 Days a Stranger (which is not that bad, mind you, but certainly not even close to the calibre of this game) are even put alongside of this one. This is, by far, the best AGS game I've tried yet. Unlike many AGS games where puzzle-solving just comes down to brute force trial-and-error, this game provides hints for every situation. There were a few hints that were a bit obscure - not so much about what to do - but how to go about it. The solution was right under my nose, but there was a part in the game where I got really frustrated and stuck for 15 minutes and had to stop playing and try again the next day with a fresh mind before I got it. Aside from the clever puzzles, which by themselves should put this game in the AGS hall of fame, the game features stunning graphics and animation. The game has a truly commercial feel about it because every scene is alive because of a small amount of animation in each one. It only takes a few simple animations in every scene to bring each scene to life (water dripping, a person doing something, etc. ), and the author apparently understood this to a great extent. My only complaint is that Pib looks a little inconsistent from the front and side views (he looks a bit too narrow - especially in the face - for the bulkiness implied by the front and back views). In any case, this is the best-looking AGS game I've seen so far. I've seen ones with better stills, but not with such dynamic scenes and characters. The only problem is that it's really short. Also, the ending, while absolutely hilarious, would have been ten times more so if the character had to go through a series of dangerous situations rather than run a bunch of simple errands. You'll all see what I mean when you finish the game for yourselves. If I send you a nickel will you make more games? Excellent little game with a pleasant and magical atmosphere, beautiful backgrounds, original and interesting characters, nice music and it was well scripted, mainly the GUI. Awesome... simply AWESOME... I can't even think of ONE bad point to it. Well, maybe it's lenght... but if not for that, it would be the FIRST on my list, even over the commercial game I played... but since it's a bit short, Day of the tentacle stay up there ;) But you Grab the second place without hesitation! I hope this is only a prequel to a longer game! Brilliant art and animations, great humour - great game... It's sooo short, though, but it may well be a good thing since it makes you crave all the more for its sequel! BTW, what's the secret puzzle? So far the best released amateur adventure game I've played. Excellent music, although I found it slightly too repetitive. The secret puzzle video is bonkers. The first time it made me laugh, the second time it made me throw up. I say this is one of the finest AGS games I've played so far. The humour is top notch, and the animations and the backgrounds are really professional. Make more games, for Pete's sake! If they are all like this one, you'll go far! This game is one of the best games I've played both amateura and commercial! It has all the qualities of a perfect game: art, animation, music, sound effects, funny dialogs and puzzles, and a great plot, even though it's short. I put it up there with Pleurgburgh, KQ2 and the Uncertainty Machine. Yes, I know what I'm saying.